My mom has been making this salad for years. As a kid I didn't like green beans and never wanted to try this salad, but as I got older I gave it a try and it's so good! 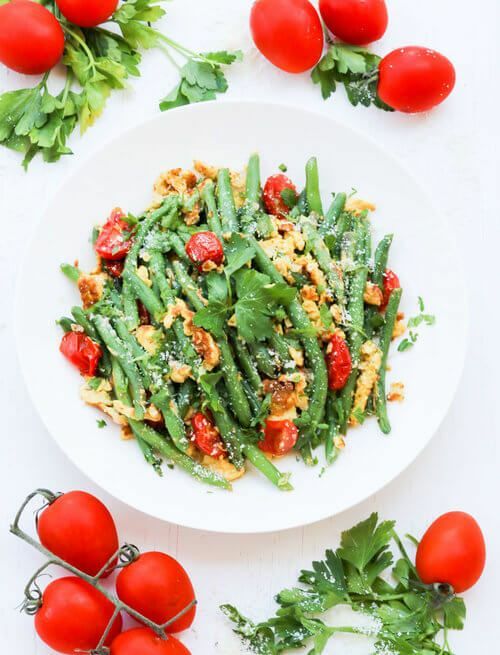 This green bean with eggs tomato and cheese salad fills you up. It's like a whole meal in one, and great for a hot summer day. That is the beauty of salads, you don't need to stand for hours in the kitchen. Now just need to make my kids eat more greens. 1) The green beans are low in calorie, but pack in a big amount of protein! So no need to include protein into this meal. Its in the beans. 2) Eggs: they pack in another source of protein! But that's not it. They are also loaded with a little of every vitamin and mineral required for the human body. How cool is that? 3) Tomato, another main ingredient has the main function in your body for heart health. That means it can protect the heart from developing many heart diseases as well as cancer. Bring 4 cups of water to a boil, add a pinch of salt and 12 oz of green beans. Boil beans until tender (5 minutes), then drain. In a small bowl whisk 2 large eggs and a small pinch of salt. Add green beans and whisked eggs, mix to get scrambled eggs. Add in 7 sliced cherry tomatoes and a pinch of salt (or to taste). Cook for another 2 minutes, stirring occasionally. Turn off the heat, add sprinkle 2 Tablespoons grated parmesan cheese and fresh parsley.